Such a technical dish but amazing when you get it right, it is all in the detail so follow the steps closely and use good puff pastry it makes a massive difference. Good luck. Trim any excess sinew off the venison loin, seal the outside in a very hot frying pan, it should be quick process and golden all around the outside. Place back in the fridge. Peel the field mushrooms cut into ¼’s then roast in a pan until moisture cooked through, drain in a colander. Place the chicken breast in a blender and puree until smooth, then add the egg white, puree again until mixed together, add half the cream and pulse until it has combined, then remove from then machine placing in a bowl and fold the rest of the cream in, season well with sea salt.Place in the fridge. Chop the mushrooms finely then fold in the enough chicken mousse to bind and combine well, place back in the fridge. For the pancake combine the flour, whole eggs and milk, whisk well and season with salt and pepper. Add the chopped herbs. Make 1 large pancake using 25cm pan and as thin as possible. Cook both side but do not dry out. Lay on greaseproof paper. Take out your mushroom mix, spread this thinly and gently over the pancake wide enough and long enough to cover around the outside of the venison loin, should be a long rectangle shape. You may not use it all. Place the venison at the closest end to you then roll and wrap using the greaseproof paper to help.Once it is completely wrapped trim the excess pancake of the ends and place back in the fridge. 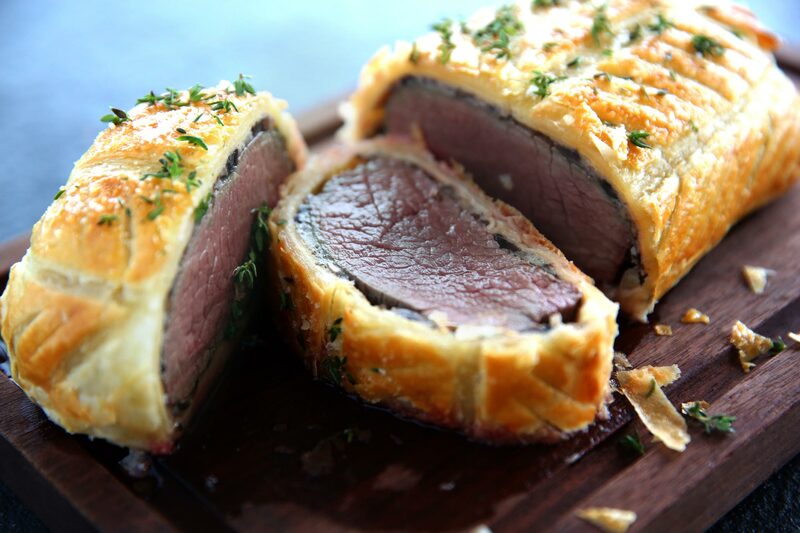 Take out your puff pastry, brush with the egg yolk all over then lay your venison on the closest end to you, roll away from you until the venison is covered, cut the pastry allowing for about 2cm of overlap at the base. Close off the end removing any air as you do so, cut the excess so 2cm on each end then tidy them up by pressing them with your thumb so the are not double thickness of pastry and folding them underneath. Place in the fridge to rest for 20 minutes. Take the venison out and score the outside with the tip of a small sharp knife, do any simple pattern you like. Brush again with egg yolk all over and then bake in a preheated oven at 190’ for 18-20 minutes until golden and pastry is crispy, rest outside for 8-10 minutes before carving and serving.